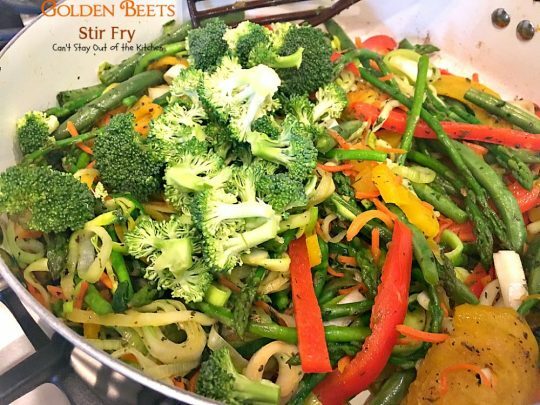 Golden Beets Stir Fry is a phenomenal Meatless Monday entree. In fact, you’ll be licking your chops after just one bite of this fantastic main dish. It’s also a great way to add beets to your diet! This is a delicious, healthy, low-calorie vegan dish with a wide assortment of veggies. Golden beets, broccoli, green beans, zucchini, carrots, asparagus, leeks and bell peppers are stir fried in olive oil and seasoned with parsley, thyme, oregano, marjoram and basil. Golden Beets Stir Fry is a tasty way to get your veggies, and perhaps a new way to eat this underused veggie. 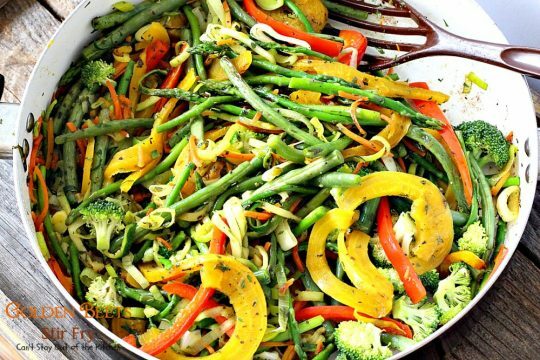 If you’re not vegan you can sprinkle Romano or parmesan cheese on top of the veggies as you serve them, but it isn’t necessary if you are trying to eliminate cheese from your diet. You can use different veggies if you prefer, but I recommend trying golden beets this way sometime. I would not recommend regular beets as they will probably bleed all over the other veggies. I saw golden beets at Sprouts today and wanted to try them. Their taste is not quite as strong as red beets and they are really healthy and delicious. I think you will enjoy this dish even though it is not a combination you are probably familiar with. This gluten free and vegan dish is a great option any time you want a substantially filling meal without meat. I think this dish would taste wonderfully with mushrooms and artichokes as well. If you enjoy stir fry dishes, Golden Beets Stir Fry will work wonderfully served over hot, cooked rice, rice pilaf, or glass noodles, but it is perfectly delicious served just like it is! When I initially published this recipe in August 2012, it was in the very early days of my blog. I was trying my best to eat healthy, but unfortunately my pictures were taken with an iPhone so they were pretty bad. For the past four years I’ve been remaking those first 600 recipes I posted during my first year of blogging. I am finally down to the final six recipes that need updating so I’m pretty excited that this project is coming to a close! 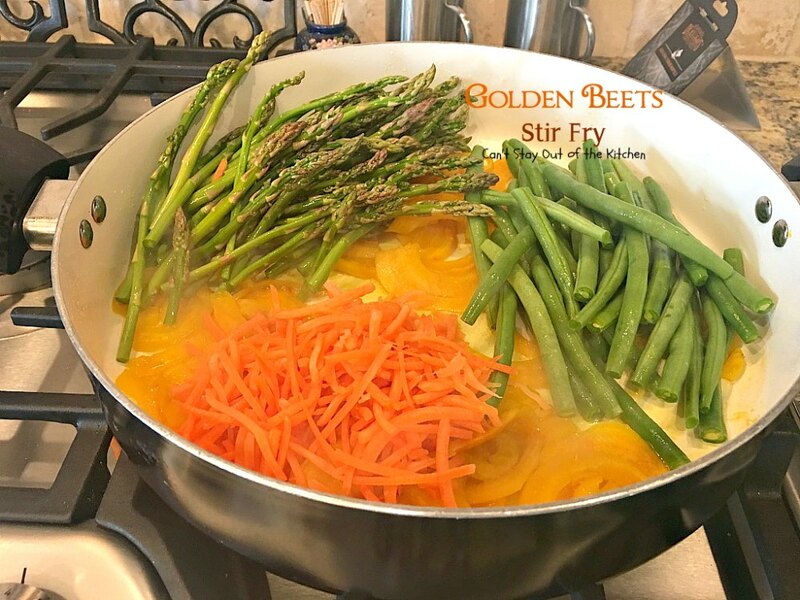 I recently remade Golden Beets Stir Fry (February 2017) for lunch with a friend. She is currently on a plant-based diet and also needs to stay away from dairy so this recipe fit the bill. I also brought a delicious Kale & Beet Salad and we enjoyed every morsel. I took a few new pictures and these are a lot better than the last ones. I changed the recipe up a little bit adding additional seasonings and removing others. I think this version turned out terrific. It’s also great reheated for leftovers. Enjoy. 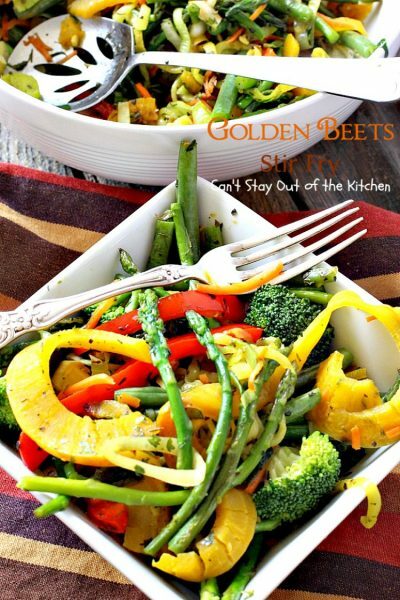 Golden Beets Stir Fry is a tasty and healthy, meatless main dish. If you’re not vegan, you can sprinkle parmesan cheese and fresh parsley over top to serve. But we actually preferred it dairy free. The seasonings are so amazing they make this stir-fry completely mouthwatering. I used these ingredients. I peeled the golden beet and then put it on a spiralizer on the “curly fry” setting. I also spiralized the zucchini. Place a few tablespoonfuls of olive oil in a large skillet. Add golden beets and sauté for about 5 minutes. Add asparagus, matchsticks carrots and green beans. Saute an additional 5 minutes. 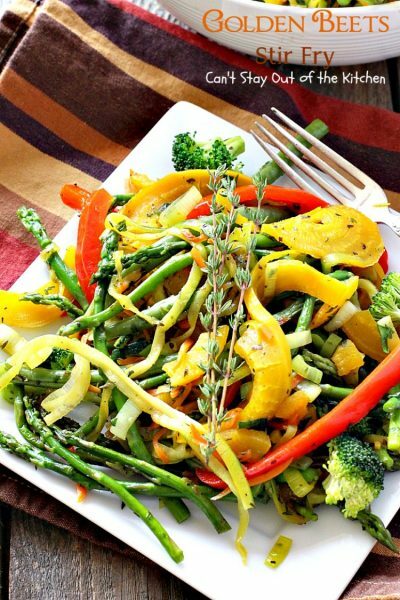 Add leeks sliced and then separated into rings, garlic, spiralized zucchini and red bell peppers julienned. Add seasonings. Saute 5-10 minutes over low to medium heat. Add broccoli and cook an additional 5 minutes until all the veggies are done. 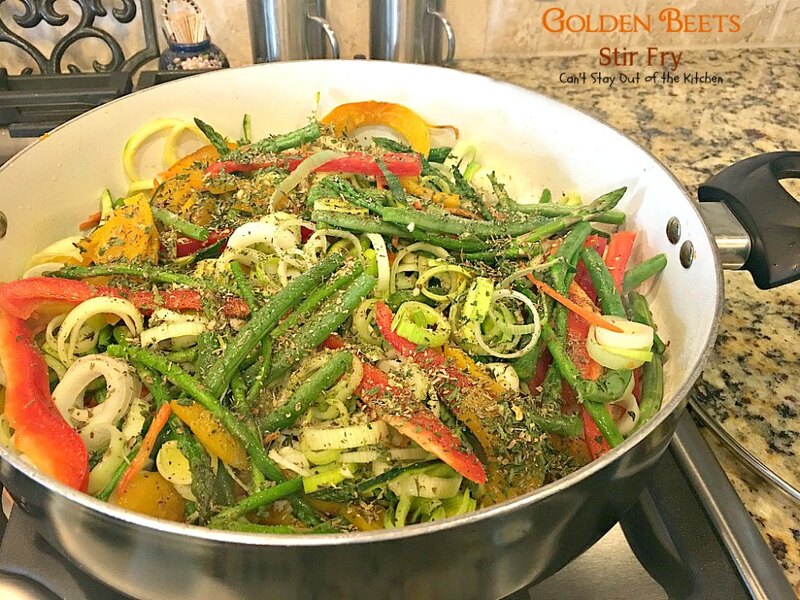 Golden Beets Stir Fry is healthy, low calorie, gluten free, vegan and clean eating. You will find this a terrific meal to serve for Lent or Meatless Mondays. 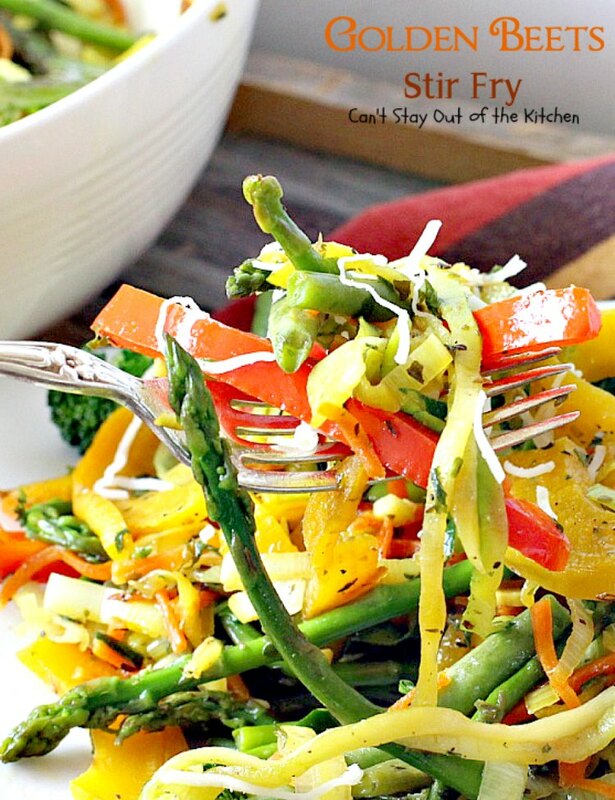 Tasty stir fry dish using golden beets, broccoli, asparagus, zucchini, green beans, bell peppers, leeks and carrots. This healthy recipe is gluten free and vegan. Place olive oil in a large frying pan and heat. Add golden beets and sauté 5 minutes. Add green beans, carrots and asparagus. Sauté an additional 5 minutes. Add sliced leeks separated into rings, bell pepper, carrots, zucchini spirals, garlic and seasonings. Sauté 5-10 minutes over low-medium heat. 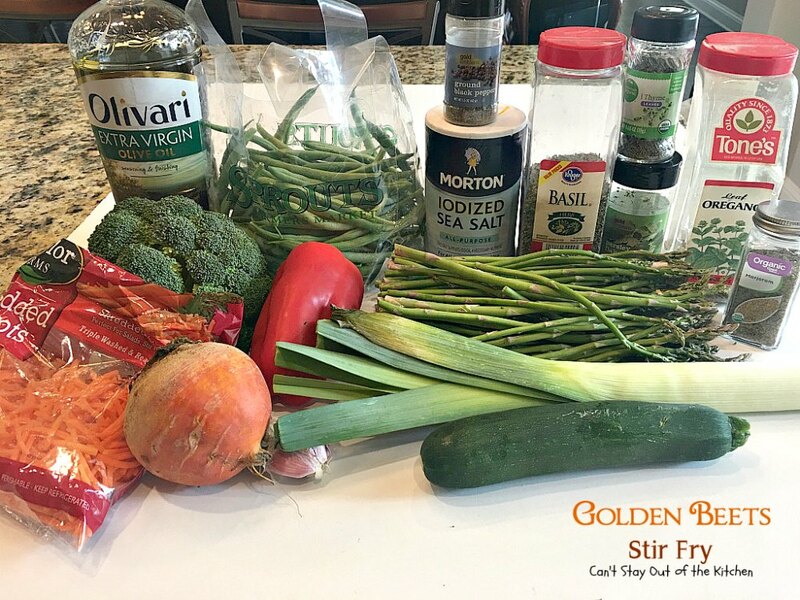 Stir in broccoli and cook an additional 5 minutes until vegetables are cooked through. To serve, place a serving on a plate and sprinkle fresh thyme. NOTE: Consider trying this with mushrooms, artichokes, and/or water chestnuts for different flavors. NOTE: You can garnish with fresh Italian six-cheese blend, if desired, and not trying to keep the meal vegan. 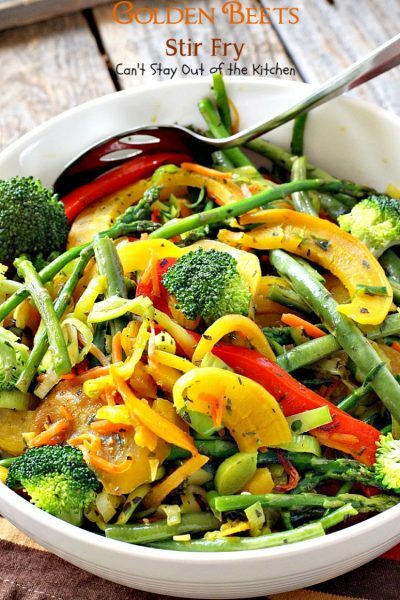 Tasty stir fry dish using golden beets, broccoli, zucchini, green beans, bell peppers and carrots. This healthy recipe is gluten free and vegan. 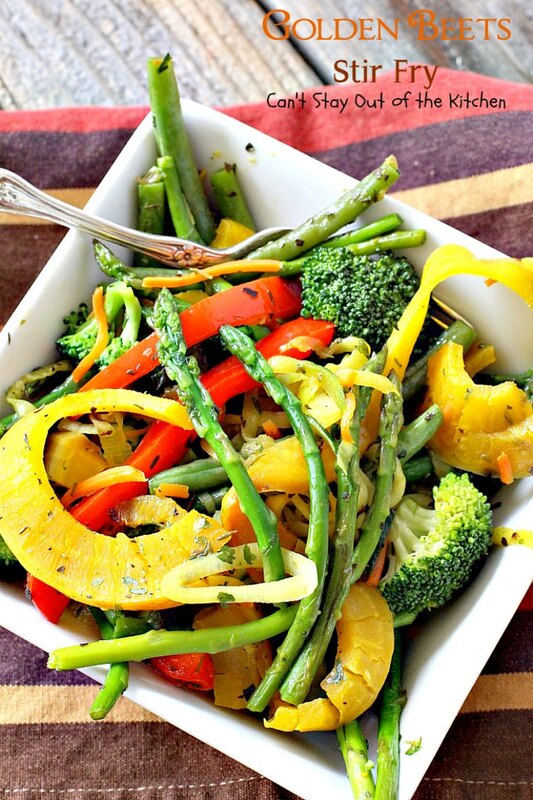 Add sliced golden beet slices and sauté a few minutes. 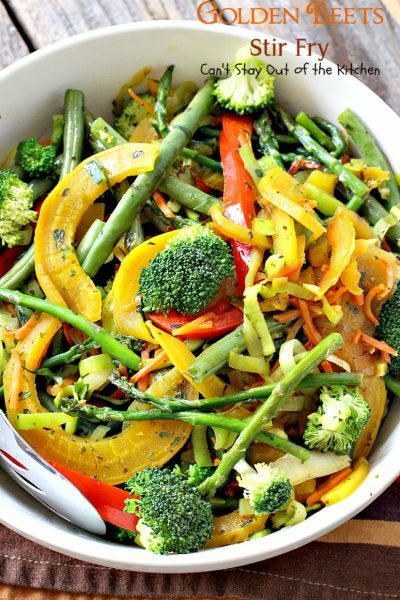 Add sliced leek, bell pepper, carrot slices, broccoli florets, zucchini slices, green beans, garlic and seasonings. 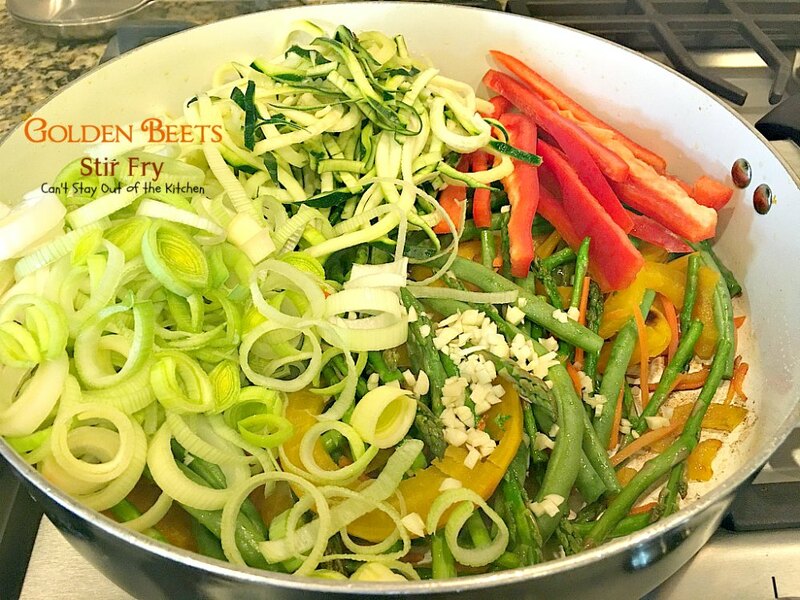 Sauté 10-15 minutes over low-medium heat until vegetables are cooked through and fork tender. To serve, place a serving on a plate and sprinkle with fresh parsley and Romano cheese if desired. Consider trying this with asparagus, mushrooms, artichokes, and/or water chestnuts for different flavors. Golden Beets Stir-Fry really turned out quite tasty. It’s a great way to make something you probably have never tried before. 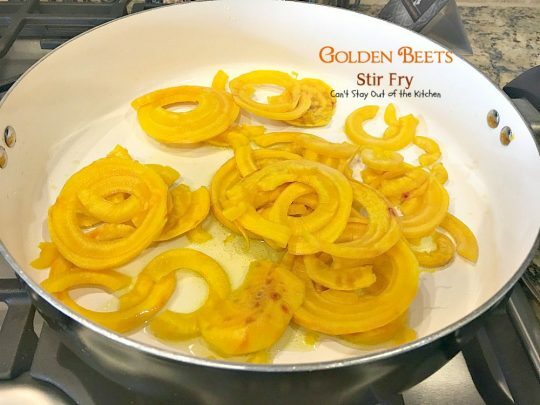 We found Golden Beets Stir Fry so filling and satisfying. We loved Golden Beets Stir Fry and believe you will too! I liked this. 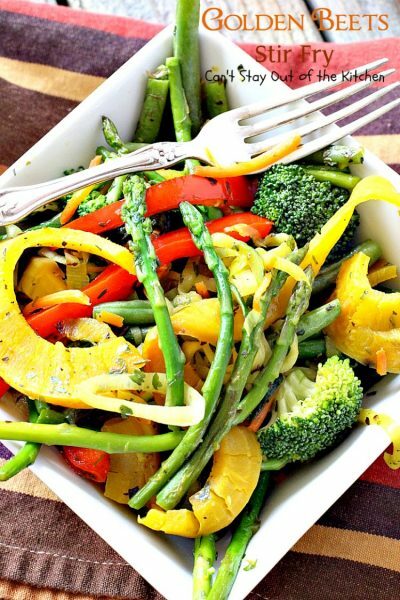 A good way to eat healthy vegetables that I don’t necessarily like very much. Stir fry kind of blends the flavors together & tones down the tastes that I am not as fond of. Great! You can try this with almost any kind of veggie, and if you prefer you can cut the beets into smaller julienne-size pieces so they won’t overwhelm the dish, also. I’m going to try another recipe for the beets later this week. I’ll let you know how it turns out!